I thought the romance in this one was a bit out of left field. I mean I liked Cassidy and Trace as a couple, but we had no warm up to their couple-ness. I guess it came upon the reader as it came upon Cassidy and Trace, by surprise! ha! 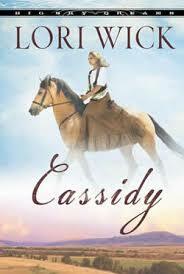 Otherwise I really liked this story and Cassidy was a sweet girl who had wonderful morals. Especially when it came to not gossiping about other people. Trace was the perfect cowboy/rescuer/hero even though he was a bit slow and did things a bit backwards in the romance department. The author does tend to preach in her books, but always short "sermons" that lead the characters to make better choices in their lives and point them towards a more perfect relationship with the Savior. If you are looking for passionate kisses in this one don't count on it! Sweet pecks here and there and some longing looks, but that is as far as the physical goes. And just in case you are wondering, I love stories like this!